Bangka Island, is the island near east of Sumatra. Even though there's not many exposures about this island yet, but since the filming of Laskar Pelangi, this island get a bit of a spotlight. My dad was born in Bangka, and I've been visiting this island once. Even though we don't have anymore families who lives in Bangka, but yeah... it's still in the blood ! :p So when an invitation came from Waha Kitchen about this new Bangka- cuisine menus, I'm pretty excited. Waha Kitchen located at this artsy hotel, Kosenda. 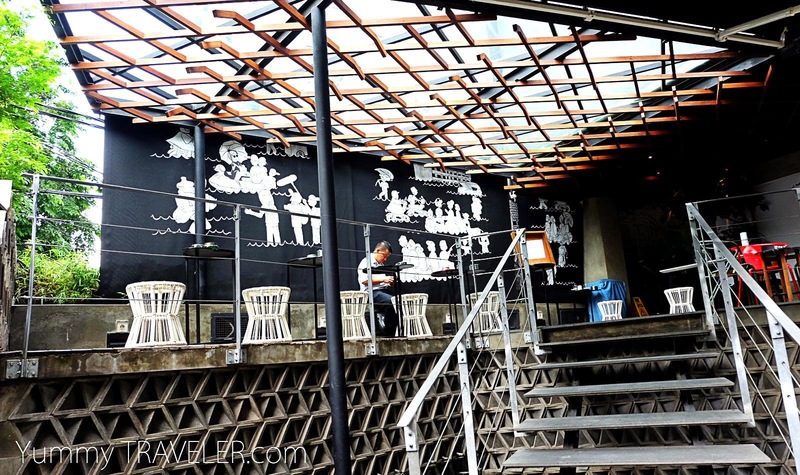 It's already well known with their urban and eclectic design, and also 'Peranakan' cuisine. For the new menus, Waha Kitchen collaborated with Chef Eddrian Tjhia also his partner from Kulat Project, Chef Firman Bachtiar, to introduce Jakarta people with Bangka cuisine. For the appetizer, we've been served with Bujan. I oftenly had this snack ! It's actually a fried shredded taro with mackerel, it's really nice to dip the Bujan into the garlicky-chili sauce. Next appetizer is Otak- Otak, or a steamed fish cake with coconut milk on top. This one is just like my dad usually make ! Savory ! For the Main Course, we've been served with variety of dishes. The first one is a twist of a traditional Lempah, which a signature dish from Bangka. Lempah is a soup dish, packed with spices like turmeric, refreshing flavor with pineapple in it and usually seafood are used in this dish. Chef Eddrian make a twist by using an Oxtail in this Lempah. It was quite sour and bit spicy, but I guess the strong beefy flavor from the oxtail, makes this Lempah not as good as I usually have. Even though he already used a Belacan ( Terasi ) from Bangka, but the soup still lacking that 'sea' flavor which I usually found in Lempah. The flavor in Lempah soup usually very bold, but this one is quite light. But the oxtail meat was tender though. Next is a Tjap Tjai Bangka. Yes this is a Stirfried Veggies, but the Bangka people put the tomato sauce in it, so it was red in color. Fried Asam Squid. My dad also usually made this. This is a stir fried squid with tamarind and sweet soy sauce. Lempah Kulat Pelawan. Ok this one deserves the spotlight because if you don't know, Kulat Pelawan is a special mushroom that only can be found in Bangka. The price......... expensive. Like for 1kg, you have to pay around IDR 1.000.000 ( around 100 USD/kg). Why it's very expensive? Because this mushroom only grow in Pelawan Tree, and it's hard to be found since it grows only during the rainy season which is August to March. This mushroom also packed with high protein and antioxidants. It's usually been dried, so you have to soaked it first in water before you cook it. The texture of this mushroom is really crunchy and fibery, just like eating a vegetables. The flavor was very distinctive, earthy umami flavor and bit smokey. In Waha Kitchen, they make it a bit lighter with using less coconut milk. Waha Fish Noodle. I'm not familiar with this dish to be honest. It was an egg noddle served with starchy mackarel soup and also some potatoes and emping. The soup kind of remind me of Chinese crab soup though. It was savory enough, but the combo just feel a bit strange to my palate. For the dessert they served us with a Cincau Mango Pudding. Love the mix flavor of the bitter Grassjelly pudding and sweet sour mango sauce. Coconut Pudding. This one was also nice, because the coconut pudding is really light, subtle and refreshing. But I think the strawberry sauce on top a bit overpowering. They also served us with this Mocktail Sangria drink. I kind of like this drink because there's a taste of spices in it. Like lemongrass or ginger, but it's just spritzy, refreshing and unique. Overall, I'm really happy to see Bangka cuisine could get a spotlight especially here in Jakarta. Thanks Kosenda Hotel, Ibu Maya, Billy Oscar for inviting !